In the injection molding industry, there are numerous coatings that may have similar properties. PFI’s most requested injection mold coating is a nickel base dry lubricant called Dura Slick – a proprietary nickel-base mold release coating. Some of the other products in the mold release coating sector are Nibore™ and Millennium KR. This article will compare our Dura Slick coating to others in the industry to paint a clear picture of overall advantages to working with PFI for mold release coatings. In addition to Dura Slick, PFI offers multiple mold coating solutions for various applications, as well as the expertise to help you choose which is right for your tooling. How are Nickel-Based Mold Coatings Typically Used? Quality mold coatings designed for low coefficient of friction are in demand due to their ability to lengthen the life of a mold, reduce maintenance costs, and decrease cycle times. There are several types of low coefficient nickel-based coatings within the injection molding industry. The two coatings in the forefront are Electroless Nickel-Boron Nitride (EN-BN) and Dura Slick which is a proprietary PFI coating. The EN-BN coating has its unique makeup and applications. This mold release coating is known for its excellent lubricity and release properties, resistance against corrosion, and longevity. EN-BN coatings are ideal for high speed, low load applications, as well as for sliding and high wear applications. Common applications for this coating include molds for medical devices, closures, automotive parts, electrical connectors and a wide variety of other plastic injection tooling. PFI can apply Dura Slick on aluminum, tool steels, and a variety of stainless. Most parts must be run slightly different to ensure optimal adhesion on the substrate. Dura Slick is excellent for wear applications such as medical components, electrical connectors, automotive, consumer products, and closures. It also has exceptional adhesion properties on almost all tool steels and aluminum. Dura Slick seamlessly lubricates the tooling to prevent materials from galling at the surface. PFI has the capacity to plate up to 0.010 pit free with the Dura Slick coating. Nibore™ is a specialty coating created to have a high resistance to wear, corrosion, and heat while maintaining release properties – like that of Dura Slick. Nibore’s™ low coefficient of friction makes it a competitor of this segment of EN-BN coatings. A benefit of EN-BN is its ability to be applied to any substrate at 185°F and be stripped without compromising the original base material in the process. Nibore™ performs accurately at a temperature of 1250°F. The high breakdown temperature allows Nibore™ to thrive in extreme conditions and situations. Some common applications of Nibore™ are unscrewing cores for closures. No anodes are required when applying Nibore™ which saves both time and money. The low coefficient of friction is advantageous in high wear applications, however not so much in galling and release capabilities. The last EN-BN coating that is a major competitor of Dura Slick is Millennium KR. This mold release coating uses an electroless phosphorus nickel plating system that produces a slick coating that that is applied to a variety of metals to prolong the life of the metal with the hardness of the coating. The Millennium KR deposits become slick and abrasion resistant after being heated to 750°F to reach 68 RC. Millennium KR is routinely applied to light metals such as aluminum to make it harder, leading to longer product life. The Millennium KR coating offers wear resistance, lubricity, material release properties, and accurate thickness where needed. Millenium KR treated products have a maximum hardness in extreme conditions, but comparative lack of heavy load wear resistance. What makes Dura Slick from PFI your top choice in release coatings for injection molds? Not only is the Dura Slick coating a premium product, but our highly experienced metal finishers are the top in the industry, making our application process a major differentiator. Our team has many years of experience with injection molding, specifically. Dura Slick release mold plating can be applied as thin as 0.00005 inches or less, and can be applied up to .010 thick for plastic dimension changes. Our ability to plate precisely and accurately allows the mold to maintain consistent uniformity from a few tenths to thousandths thick of plating. The hardness, lubricity, and low-maintenance that Dura Slick provides, combined with the expertise of our injection molding metal finishers is unparalleled in the industry. When comparing the mold coating release of each product, Dura Slick provides the best service from the initial mold to the hands of the end customer. Learn about all the capabilities PFI’s Dura Slick mold release coatings have to offer and have our experienced team help you with your Dura Slick needs today! 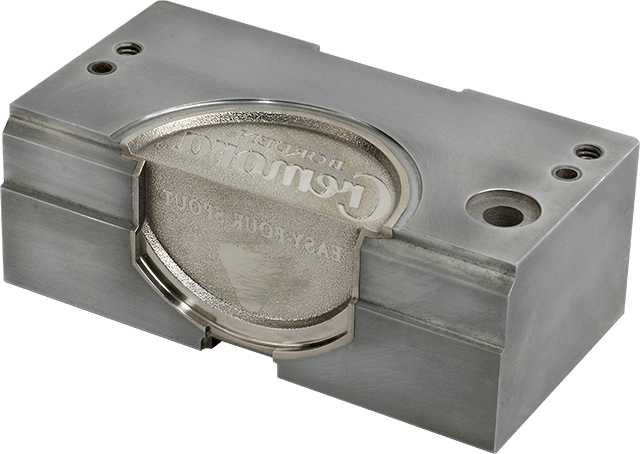 Progress for Industry, Inc. provides the highest quality proprietary nickel-based injection mold plating service for any application and extreme condition.